Home > Birthday Hats, Bibs & Socks > Girl's 1st Birthday Hat, Hand Painted by Pretty Little Things. 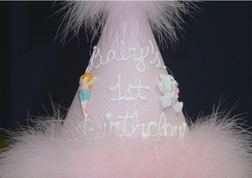 Girl's 1st Birthday Hat, Hand Painted by Pretty Little Things. 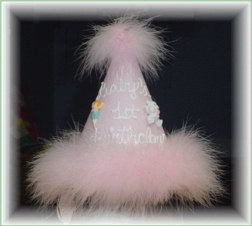 This is our little birthday hat to match the pink birthday dresses and outfits for new one year olds! The shiny colors of the cone are accented by "Baby's 1st Birthday" and a pretty maribou. The hat secures to the child's head by means of an elastic strap under the chin.